Casio has been a leader on the market since its foundation in 1946. Functions: Multifunction. Why buy from us. Water Resistance: 10 ATM. NICE BLACK COLOURED RECTANGULAR CASE, WITH SILVER, BLUE, YELLOW, AND RED LETTERING ON THE FACE. CLASSIC DESIGN MAKES THIS WATCH JUST STAND OUT FROM THE REST. STYLISH SPORTS WATCH WITH BACKLIGHT, ALARM FUNCTION, STOPWATCH, AND WATER RESISTANT TO 50M. Stopwatch:1/100th Sec Stopwatch. Illuminator:An electro-luminescent panel causes the entire face to glow for easy reading. RRP £70.00 Our Price £42.95. Zippo Lighters. Official Casio Agents we have a large range. Our Products. RRP: £32.00. You will have a huge range of watches to choose from and a variety that is unparalleled in the market. POCKET WATCH. Strap Colour: Silver. Strap Type: Bracelet. Band Width (cm): 1.5. Band Length (cm): 22. Premium watch from G-ShockAviator collection. Gravity Defier : This watch can withstand up to 15G’s of force! Shock-resistant construction which protects against impact and vibration. The battery supplies the watch with sufficient energy for approx. Pepper / salt mill. 2 x Casio F91W digital unisex wrist watch black, new and original box. Casio WV-58U-1AVES digital radio watch new and original box. Casio F 91 Unisex Watch new and original box. Casio LA670WEGA-1EF ladies watch ladies watches new and original box. Band MaterialStainless Steel. Band ColourSilver. Dial Window Material TypePlastic. CalendarDoes not have a date function. Dial ColourBlack. Case MaterialResin. The case back is made from stainless steel. TOUGH SOLAR WR100 LIMITED 100% GENUINE. Band material Titanium. Alarm Five alarm. ~ MODEL DISCONTINUED - VERY RARE ~. Case material Stainless steel. Case back Screw flagging down type. RRP: £50.00. You will have a huge range of watches to choose from and a variety that is unparalleled in the market. POCKET WATCH. Strap Type: Bracelet. Band Width (cm): 1.5. Band Length (cm): 22. Strap Colour: Silver. TOUGH SOLAR WR100 LIMITED. TRIPLE SENSOR. Battery level indicator. 100% GENUINE. Solar powered. Button operation tone on/off. Full auto EL light. Size of case / total weight. Casio WVA M640D 2AER wave Ceptor gents watch. Series: Casio wave Ceptor. cheese mill. Pepper / salt mill. Donna Karan DKNY. 2 x Casio F91W digital unisex wrist watch black, new and original box. Casio B640WC-5AEF digital Unisex Watch rose gold watch new and original box. Indicator of energy battery. Tipo Solar. Funciones SOLAR. Carcasa RESINA. Género Hombre. - Steel cover fixed with 4 screws. MPN REF PRG-600-1ER. EAN 4549526136429. Casio Edifice Infiniti Red Bull Racing Limited Edition Watch ERA-201RBK-1A, ERA201RBK. • EDIFICE logo stamped on the crown, back cover, and buckle. INFINITI Red Bull Racing Limited Edition. • Sapphire glass. Casio collection Herrenuhr Bracelet Watch W-753-1AVES. Cd = battery contains more than 0,002 mass percent cadmium. Marke Casio. Stopwatch function - 1/100 sec - 100 hours. A number of degrees is displayed by pressing the function button. (Ideale ad es. acustico alla scadenza). - 1 ore (con ripet. automatica). You will find quality products at the lowest price on the market. - If the product has been customized. - If the product has been used / worn. RRP: £25.00. You will have a huge range of watches to choose from and a variety that is unparalleled in the market. POCKET WATCH. Battery: CR2016. Weight (Grams): 21. Watches2U have now been in operation for over 15 years and have a wide range of different great value products. 81025 Marcianise(CE). Zona Industriale Asi Sud. Showroom 1008-1009. Polo della Qualitià. Golden srl. CONNECT AND SHARE! CONDITIONS OF SALE. WHERE WE ARE. Casio G-Shock GA1000-4A. 100% AUTHENTIC. Bracelet Color: Orange. Bracelet: Rubber. Hands: Luminous. Markers: Orange. Dial Color: Black. Bezel: Fixed. Is a wooden box very authentic school digital watch. The solar frog light, such as fluorescent light powered Casio's own solar charging system, of course. Battery: tough solar. Color Band: BLACK. WITH TR ACKING NUM BER. A CASIO unisex wristwatch with resin case. Casio has been a leader on the market since its foundation in 1946. Gender: Unisex. Why buy from us. Water Resistance: 5 ATM. MPN HDC-600. EAN No aplicable. Tipo Batería. If in doubt, we will be happy to help. A CASIO unisex wristwatch with resin case. Casio has been a leader on the market since its foundation in 1946. Gender: Unisex. Functions: Multifunction. Why buy from us. Water Resistance: 5 ATM. Casio Collection featuring, a Daily Alarm as well as Auto Calendar. New Casio Watch. fficial Authorised Dealer for Casio . We are an Official Authorised Dealer for Casio. The Daily Alarm. LCD is used to illuminate the watch face. 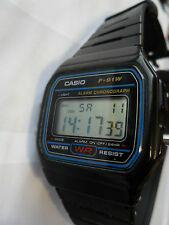 ORIGINAL Casio Watch Collection F91WM-7AEF with 2 years warranty. It sends the watch in a box gift from CASIO. The strap of this watch features a safety clasp that prevents any unintentional opening. /- 30 sec per month. 10 Years - 1 Battery. 10 years - 1 battery. Significantly reduced energy consumption. This model features 5 individual alarms. Pepper / salt mill. 2 x Casio F91W digital unisex wrist watch black, new and original box. Casio B640WC-5AEF digital Unisex Watch rose gold watch new and original box. Casio F 91 Unisex Watch new and original box. Casio Watch. Japan Movt New Genuine Casio Watch Tough Solar 5 Alarms AQ-S810W-. CASIO EDIFICE. CASIO SHEEN. CASIO G-Shock. CASIO Baby-G. Casio Clock. CASIO PRO-TREK. Marke Casio. Resin Band. Stopwatch function - 1/100 sec - 1 hour. Pb = battery contains more than 0,004 mass percent lead. Anzeigeformat digital. Ideal if you frequently make overseas calls. Once set, the automatic calendar always displays the correct date. /- 30 sec per month. The right alarm for any situation. Four auto-repeat alarms available: 1. 10 Years - 1 Battery. 10 years - 1 battery. Significantly reduced energy consumption. We are looking forward to your order! Casio B640WD-1AVEF Watch - Series: Collection. (with autorepeat). /- 30 sec per month. The right alarm for any situation. Four auto-repeat alarms available: 1. 3 Years - 1 Battery. We are looking forward to your order! Stainless Steel Band. • Big case size. • Stopwatch. Triple-fold Clasp. Case / bezel material: Resin. Casio Mens Watches LCD Digital Water Resitant 50m Waterproof Sports Watch Men. Condition is Used. Dispatched with Royal Mail 2nd Class Letter. The CASIO Collection - Beautifully retro. Type: Watch. Crown: Push Button. CaseThickness: 16.7mm. Alarm: Yes. Australia, Belgium, Brazil, Canada, Croatia, Denmark, Estonia, Finland, France, Germany, Gibraltar, Great Britain, Hong Kong, Hungary, Ireland, Israel, Italy, Japan, Latvia, Lithuania, Luxembourg, Malaysia, Malta, Netherlands, New Zealand, Portugal, Singapore, South Korea, Spain, Sweden, Switzerland. About Product. It will be notified to you when you request for a RMA. If we have made a mistake we will always rectify it. Australia, Belgium, Brazil, Canada, Croatia, Denmark, Estonia, Finland, France, Germany, Gibraltar, Great Britain, Hong Kong, Hungary, Ireland, Israel, Italy, Japan, Latvia, Lithuania, Luxembourg, Malaysia, Malta, Netherlands, New Zealand, Portugal, Singapore, South Korea, Spain, Sweden, Switzerland. Band material: Stainless Steel. Band color: Silver. (included). Dial color: Black. Model year: 2017. If we have made a mistake we will always rectify it. Australia, Belgium, Brazil, Canada, Croatia, Denmark, Estonia, Finland, France, Germany, Gibraltar, Great Britain, Hong Kong, Hungary, Ireland, Israel, Italy, Japan, Latvia, Lithuania, Luxembourg, Malaysia, Malta, Netherlands, New Zealand, Portugal, Singapore, South Korea, Spain, Sweden, Switzerland. Dial window material type: Mineral. 36 mm resin case with mineral dial window. Item weight: 3.84 Ounces. Australia, Belgium, Brazil, Canada, Croatia, Denmark, Estonia, Finland, France, Germany, Gibraltar, Great Britain, Hong Kong, Hungary, Ireland, Israel, Italy, Japan, Latvia, Lithuania, Luxembourg, Malaysia, Malta, Netherlands, New Zealand, Portugal, Singapore, South Korea, Spain, Sweden, Switzerland. Terrace and Garden. 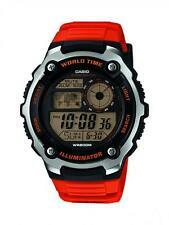 Watch Casio W-96H-1A, Sports Watch. Unisex LCD Digital Clock. Safety and security. Anti Bark Necklaces. Plate / Kitchen. Fitness and sport. Car Accessories. Watch Casio. - model number: LA670WA-1DF. - water resistance: 3 ATM. - clasp type: foldover. - band colour: silver. - band material: steel. Very large clear dial. Dial in good condition with a few light scratches. Case is 39mm across excluding crown. Waterproof 50m. (ISO 2281). 38 mm across the face. — LED light – A light-emitting diode (LED) is used to illuminate the watch face.